While plaster may be the more “traditional” method of immortalizing little feet, newer clay products and techniques can be considered just as permanent. The main plus—and it’s a big one—of using clay rather than plaster is that clay is very forgiving. Unlike plaster, which often gives you just one shot to get it right, if baby squirms during the making of a clay impression, all you have to do is smooth over or re-roll the clay. (Please note that I’m referring not only to “clay” in the true sense, but also clay-like products that can retain an impression.) Make sure Baby’s hands or feet are clean and dry before you begin, and press away! There are several products on the market designed specifically for making baby footprints and baby handprints using clay. 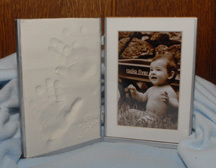 When my son was 9 months old, I made impressions of his hands using a kit that included clay and a frame—one side fits a 4” x 6” (matted) or 5” x 7” photo, with a glass panel fitting over it. Some companies make shadow-box frames that have space for a footprint on one side and either a 4” x 6” or 5” x 7” photo on the other. One thing to note on these kits is that typically, with a baby newborn through about age 1, you can fit both hands on the clay panel; with older children you may be able to get only one handprint on there. If you’re going for two, be sure to stagger them so they both fit. You can also purchase your own clay. Make sure it’s the kind that dries hard, such as polymer air-dry clay by makers such as Creative Paper Clay, La Doll or Premier. A company called Makins produces air-dry clay in an array of colors! You can also paint most clays after they dry. I’ve found that clay that air-dries doesn’t tend to shrink or shift like baked clay might. Popular brands such as Sculpey and Fimo are typically baked in an oven. Before the clay dries, poke a hole through the top and you’ve got a holiday ornament! Some parents may remember the “Play-Doh” method of making children’s handprints. Just roll out the dough, press in hand or foot, and let it dry. However, Play-Doh and its counterparts are notoriously prone to crumbling, so do this with fun in mind, not permanence. 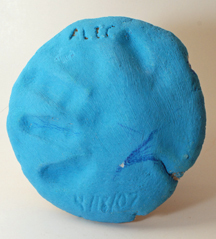 Visit www.freepreschoolcrafts.com to make this classic no-bake clay child handprint craft.